A couple of weeks ago, I had to do a research about Alexina Louie (a Canadian composer of Chinese descents) for the last music history lesson of the year. I was reading interesting articles one after the other, then stumbled upon the program of master classes which were given by the composer to “talented young composers” last summer in Ottawa. What a surprise to find among them one of my friend, David A., who use to study with me in college (and the first year of University)!! We use compare our theory homeworks and experiment with the sounds of a piano. Later about the same week, Marylise, a long time estranged friend (but not forgotten) found my email and wrote me! She apparently googled my name and found me via internet. I am wondering if after a laps of 10 years it is common to contact estranged friends. Once in a while I remember about someone with whom I’ve crossed paths and type his/her name on a search engine to see what comes up. In the last year only I’ve contacted/been contacted by so many friends (mainly French). It’s fabulous. Yesterday at the studio I had 2 new students. The first one was a surprise, I hadn’t got the message that he was starting with me that day. Anyway, it was fun. He is chinese, from Beijing, and just arrive in Canada. His mum was sitting with us while he was having his first piano lesson. I think he learn a couple of words in English such as “right hand, left hand, together, repeat”… 😉 And the bonus for me is that I will probably learn a bit of Chinese too!! (I recognized the word “left” after hearing her repeating it many times). At the end of the lesson I had time in between student to discuss with the mum and Mrs. H, another Chinese mother of 3 who is also friend of the first one. She was joking with me: “Ha! You speak 5 languages, but not Chinese!”, “not yet”, I answered. We did it. We bought ourselves a piano. I still can’t believe it, since it will be delivered only Friday. I have to see it I guess, here in the livin’ room, to be able to realise it’s really true! We knew we had to buy one since the keyboard I am using has only been lent to us for a while. Today when he came to pick me up at work I thought we were going to shop around. It was the middle of the afternoon, I had no driving classes to attend, no students to teach, so we had planned to go see the pianos. What we had in mind was a digital piano because it’s easier to move around than a “real” piano. We’ll get the real thing when we’ll stay in the same place for long enough, or have our own house. Also, no need of tuning, which is a good thing in itself because we don’t have the time to learn how to do this by ourselves yet. I need the heavy feel of the piano keys though. My hands are naturally heavy and strong. I hate it when I’m playing chords or scales and the keyboard, which is on a stand, starts to shake! 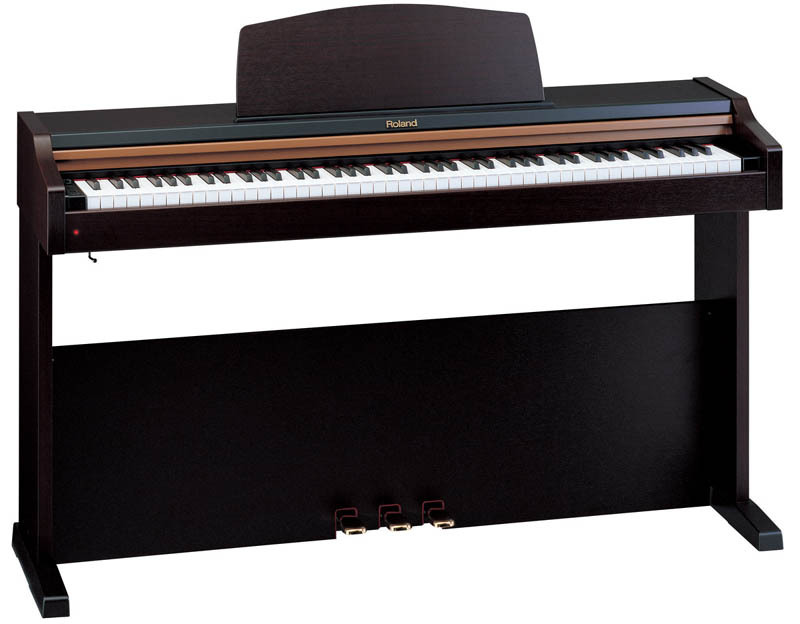 The good companies today offers digital pianos that or not only weighed keys, but has also the hammer action of the real pianos! The feel is incredibly similar! My only concern was the harmonics. When you play on a real piano, the strings that resonate in the body of the instrument create/have harmonics, which is what makes a sound richer and unique. That would be the one thing that couldn’t/wouldn’t be possible to digitalize (don’t know if that’s a word). Well, I’ve been stunned by the sound that Roland makes now. One can even hear the hammer hitting the sting in the high register and the richer resonances of the lower notes! Incredible but true. Well, of course we could only afford the “cheapest” one, but it’s still our most expensive possession… At least we know that it’s a working tool. I need it to teach, my students need to experience a good sound, feel & touch, at least during their lessons! Can’t wait ‘till Friday!! Looks like a piano, uh? What I like best is the lack of a thousand buttons that often makes it look more like a gadget than a musical instrument. It doesn’t mean that the HP101 doesn’t have the many options of a digital piano, such as different instrument’s sounds, metronome, and quite a few songs in memory (from which you can select to play one hand only, to practice the other on the mean time)… But to activate those is kind of hidden; by pushing the “option” button and a specific key of the keyboard! How smart is that!?! All in all, I’m glad that my husband takes decisions faster than I do, because one or two months from now I would still be thinking of it! Last week I went to our usual video store, which also buys/sells used CDs and DVDs, and I bought the first season of Lost. Since we don’t have a TV and everybody has been telling me that the show is good, I figured that it was cheaper to buy it used than renting it… And yes, I’m curious.